It is said that birds of a feather flock together. That is a true statement as it relates to investors who work in the same occupation. Research indicates that people in specific occupations tend to invest in like ways, and tend to use advisors in similar fashion. Spectrem’s study on investor-advisor relationships includes research on investors based on occupation. Advisor Relationships and Changing Advice Requirements shows that investors from the field of Information Technology are different than investors who are Educators, and includes dozens of other examples of occupational difference in investing decisions. Among Millionaires with a net worth between $1 million and $5 million, the most popular occupations are Professionals (doctors, lawyers and accountants), Managers (which includes Senior Corporate Executives), Business Owners, Educators and Information Technology. Those occupations make up 60 percent of the Millionaire investors in the study. Advisors working with investors from those fields will find the Spectrem study revealing. For example, Educators are much more likely to allow financial advisors greater control over their investments than investors from other occupations. Educators, on average, turn over 56 percent of their investable assets to advisors either for partial or full control of the investment options for those assets. In contrast, investors from Information Technology only turn over 43 percent of their assets and maintain complete personal control of 56 percent. 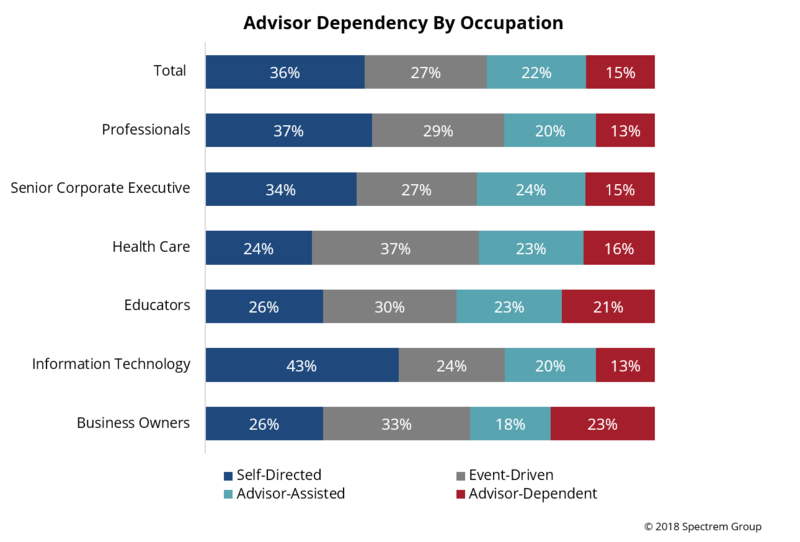 In corresponding fashion, 44 percent of Educators consider themselves to either be Advisor-Assisted or Advisor-Dependent, with a relatively high dependence on the services of an advisor. Only 27 percent of Professionals consider themselves similarly dependent on an advisor. Being advisor-dependent is not a bad trait to have. It’s a choice which investors make based on their need for assistance versus their desire to handle investments on their own. Educators are often investors who obviously choose to accept assistance. While Educators are more likely to be dependent upon an advisor, Managers are more likely to be satisfied with the performance of their advisor. Eighty-two percent of Managers report satisfaction with their advisor, compared to only 70 percent of Professionals. The fact that Professionals report the lowest level of satisfaction in their advisor is interesting because doctors, lawyers and accountants are so similar to advisors in terms of their job requirements. They all provide a service for which they are paid a fee, and client satisfaction plays a huge role in the success of their firm. Would doctors or lawyers be pleased to hear only 70 percent of their clients are satisfied with their performance? Investors from different occupations have differing views on the importance of timely communication from their advisor. Almost 60 percent of Business Owners would consider firing their advisor if they did not get phone calls returned in a timely fashion, while only 41 percent of investors from the field of Information Technology share that opinion. Of course, the IT investors might not be placing phone calls at all, choosing to text or e-mail or tweet an information request. It is Business Owners who are more likely to recommend their advisor to others. Fifty-seven percent of Business Owners say they would recommend their advisor to friends or family, while only 45 percent of Professionals are willing to do so. Again, it is interesting that Professionals are less likely to recommend their advisor, considering that their success is due in part to referrals from others. It is never safe to make assumptions, but the research on occupational bias in investing shows that advisors can begin conversations with investors with some sense of what might drive them in terms of investment strategy. The safest bets seem to be that Educators will be both wary and dependent upon their advisor, while Professionals will be both knowledgeable and hard to please.